The Battle of Yorktown or Siege of Yorktown was fought from April 5 to May 4, 1862, as part of the Peninsula Campaign of the American Civil War. Marching from Fort Monroe, Union Major General George B. McClellan's Army of the Potomac encountered Major General John B. Magruder's small Confederate army at Yorktown, behind the Warwick Line. McClellan suspended the march up the Peninsula toward Richmond, and settled in for siege operations. On April 5, the IV Corps of Brigadier General Erasmus D. Keyes was the first to encounter Confederate defensive works at Lee's Mill, an area McClellan expected to move through without resistance. Magruder's ostentatious movement of troops back and forth convinced the Federals that his works were strongly held. As the two armies fought an artillery duel, reconnaissance indicated to Keyes the strength and breadth of the Confederate fortifications and he advised McClellan against assaulting them. McClellan ordered the construction of siege fortifications, and brought his heavy siege guns to the front. In the meantime, General Joseph E. Johnston reinforced Magruder. On April 16, Union forces probed a point being strengthened in the Confederate line at Dam Number one. 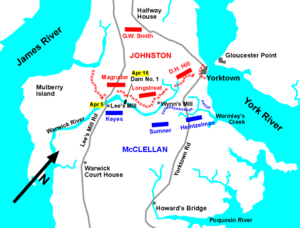 Failure to exploit the initial success of this attack, however, held up McClellan for two additional weeks, while he tried to convince the U.S. Navy to bypass the Confederates' big guns at Yorktown and Gloucester Point and ascend the York River to West Point, thus outflanking the Warwick Line. McClellan planned for a massive bombardment to begin at dawn on May 5, but the Confederate army slipped away during the night of May 3, toward Williamsburg. McClellan had chosen to approach the Confederate capital of Richmond, Virginia, with an amphibious operation that landed troops at Fort Monroe, at the tip of the Virginia Peninsula. His Army of the Potomac, numbering 121,500 men, transported starting on March 17, by 389 vessels. His plan was to use U.S. Navy forces to envelop Yorktown, but the plan was disrupted by the emergence of the Confederate ironclad CSS Virginia in the Battle of Hampton Roads (March 8 and March 9, 1862). Because of the threat of the Virginia on the James River and the heavy Confederate batteries at the mouth of the York River, the Navy could not provide assurances to McClellan that they could control either the York or the James, so he settled on a purely land approach toward Yorktown. The Confederate defenders of Yorktown were led by Maj. Gen. John B. Magruder, who initially commanded only 11–13,000 men; the rest of the Confederate forces, under the overall command of General Joseph E. Johnston, were spread out across eastern Virginia at Culpeper, Fredericksburg, and Norfolk. Magruder constructed a defensive line from Yorktown on the York River, behind the Warwick River, to Mulberry Point on the James River, taking advantage of some trenches originally dug by Cornwallis in 1781, effectively blocking the full width of the Peninsula, although none of the defensive works were adequately manned at that time. McClellan's plan was for Major General Samuel P. Heintzelman's III Corps to fix the Confederate troops in their trenches near the York River, while the IV Corps, under Brigadier General Erasmus D. Keyes, enveloped the Confederate right and cut off their lines of communication. McClellan and his staff were unaware of the extent of Magruder's line, assuming it was concentrated only in the immediate vicinity of Yorktown. 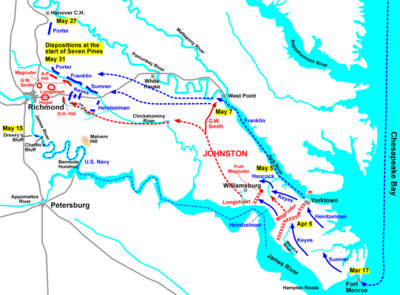 On April 4, 1862, the Union Army pushed through Magruder's initial line of defense, but the following day encountered his more effective Warwick Line (from Yorktown south along the Warwick River across the Peninsula to Mulberry Island on the James River). McClellan, the victim of faulty intelligence, as he often was during the war, estimated that the Confederates had 40,000 troops in the defensive line and that Johnston was expected to arrive quickly with an additional 60,000. Due to the nature of the terrain, it was difficult to determine the exact disposition of the Confederate forces. Magruder, an amateur actor before the war, exacerbated McClellan's confusion by moving his infantry and artillery in a noisy, ostentatious manner, making them appear to be a much larger force than they actually were. The action at Lee's Mill, on April 5, was the first encounter of the IV Corps with the right flank of Magruder's line, earthworks manned by the division of Major General Lafayette McLaws. The 7th Maine Infantry Regiment deployed as skirmishers and stopped about 1,000 yards before the fortifications, where they were soon joined by the brigade of Brigadier General John Davidson and artillery. While Keyes ordered reconnaissance and additional units arrived, an artillery duel took place for several hours, but there was no infantry fighting. On April 6, men from the 6th Maine and 5th Wisconsin, under the command of Brigadier General Winfield Scott Hancock, performed reconnaissance around Dam Number One, where Magruder had widened the Warwick to create a water obstacle nearby. They drove in the Confederate pickets and took some prisoners. Hancock considered this area to be a weak spot in the line, but orders from McClellan prevented any exploitation. Keyes, deceived by Magruder's theatrical troop movements, believed that the Warwick Line fortifications could not be carried by assault and so informed McClellan. To the amazement of the Confederates, and the dismay of President Abraham Lincoln, McClellan chose not to attempt to break through the line, but ordered his army to entrench in works parallel to Magruder's, and besiege Yorktown. McClellan reacted to Keyes's report, as well as to reports of enemy strength near the town of Yorktown, but he also received word that the I Corps, under Maj. Gen. Irvin McDowell, would be withheld for the defense of Washington, instead of joining him on the Peninsula as McClellan had planned. For the next 10 days, McClellan's men dug while Magruder steadily received reinforcements. By mid April, Magruder commanded 35,000 men, barely enough to defend his line. Although McClellan doubted his numeric superiority over the enemy, he had no doubts about the superiority of his artillery. The siege preparations at Yorktown consisted of 15 batteries with more than 70 heavy guns, including two 200-pounder Parrotts and 12 100-pound Parrots, with the rest of the rifled pieces divided between 20-pounder and 30-pounder Parrotts and 4.5-inch Rodman siege rifles. These were augmented by 41 mortars, ranging in size from 8 inches to 13-inch seacoast mortars, which weighed over 10 tons and fired shells weighing 220 pounds. When fired in unison, these batteries would deliver over 7,000 pounds of ordnance onto the enemy positions with each volley. As the armies dug in, Union Army Balloon Corps aeronautic Professor Thaddeus S. C. Lowe used two balloons, the Constitution and the Intrepid, to perform aerial observation. On April 11, Intrepid carried Brigadier General Fitz John Porter, a division commander of the III Corps, aloft, but unexpected winds sent the balloon over enemy lines, causing great consternation in the Union command before other winds returned him to safety. Confederate Captain John Bryan suffered a similar wind mishap in a hot air balloon over the Yorktown lines. On April 16, the Union probed the defensive line at Dam Number one, the point on the Warwick River near Lee's Mill where Hancock had reported a potential weakness on April 6. After the brief skirmish with Hancock's men, Magruder realized the weakness of his position and ordered it strengthened. Three regiments under Brigadier General Howell Cobb, with six other regiments nearby, were improving their position on the west bank of the river overlooking the dam. McClellan became concerned that this strengthening might impede his installation of siege batteries. His order to Brigadier General William F. "Baldy" Smith, a division commander in the IV Corps, was to avoid a general engagement, but to "hamper the enemy" in completing their defensive works. 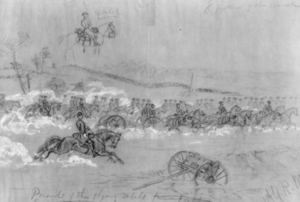 Following an artillery bombardment at 8 a.m., Brigadier General William T. H. Brooks and his Vermont Brigade sent skirmishers forward to fire on the Confederates. In a visit to the front, McClellan told Smith to cross the river if it appeared the Confederates were withdrawing, a movement that was already underway by early afternoon. At 3 p.m., four companies of the 3rd Vermont Infantry crossed the dam and routed the remaining defenders. Behind the lines, Cobb organized a defense with his brother, Colonel Thomas Cobb of the Georgia Legion, and attacked the Vermonters, who had occupied the Confederate rifle pits. In battle, drummer Julian Scott made several trips across the fire-swept creek in order to assist in bringing off wounded soldiers. Later, he was awarded the Medal of Honor, along with First Sergeant Edward Holton and Captain Samuel E. Pingree. Unable to obtain reinforcements, the Vermont companies withdrew across the dam, suffering casualties as they retreated. At about 5 p.m., Baldy Smith ordered the 6th Vermont to attack Confederate positions downstream from the dam while the 4th Vermont demonstrated at the dam itself. This maneuver failed, as the 6th Vermont came under heavy Confederate fire and were forced to withdraw. Some of the wounded men were drowned as they fell into the shallow pond behind the dam. From a Union perspective, the action at Dam Number One was pointless, it cost them casualties of 35 dead and 121 wounded; the Confederate casualties were between 60 and 75. Baldy Smith, who was thrown from his unruly horse twice during action, was accused of drunkenness on duty, but a congressional investigation found the allegation to be groundless. For the remainder of April, the Confederates, now numbering 57,000 and under the direct command of Johnston, improved their defenses while McClellan undertook the laborious process of transporting and placing massive siege artillery batteries, which he planned to deploy on May 5. Johnston knew that the impending bombardment would be difficult to withstand, so began sending his supply wagons in the direction of Richmond on May 3. Escaped slaves reported that fact to McClellan, who refused to believe them. He was convinced that an army whose strength he estimated as high as 120,000 would stay and fight. On the evening of May 3, the Confederates launched a brief bombardment of their own and then fell silent. Early the next morning, Heintzelman ascended in an observation balloon and found that the Confederate earthworks were empty. McClellan was stunned by the news. He sent cavalry under Brigadier General George Stoneman in pursuit and ordered Brigadier General William B. Franklin's division to reboard Navy transports, sail up the York River, and cut off Johnson's retreat, setting the stage for the subsequent Battle of Williamsburg. ↑ Sears, p. 42; Burton, p. 15. ↑ Burton, p. 15; Salmon, p. 76; Kennedy, p. 88. ↑ Salmon, pp. 76-77; Rickard, np. History of "Battle of Yorktown"
This page was last modified on 20 May 2016, at 22:28.